The ivory trade is reason enough to keep conservationists and elephant lovers awake at night. Both Asian and African elephants are facing ever-increasing dangers from poachers after their tusks. Now Asian elephants -- estimated to be as few as 50,000 in the wild -- are under threat for another nauseating reason: poachers in Myanmar killing the animals for their skin. The problem has been particularly acute in Mong La, a near-lawless, semi-autonomous region of northeastern Myanmar on the border with China, where tourists from the latter stream into Myanmar for gambling, prostitution and illegal wildlife products. An investigation by TRAFFIC (also a Moving Giants "Elephant Champion") found that the number of elephant-skin products in Mong La shops and stalls rose at a jaw-dropping rate, from just four in 2006 to 1,238 in 2013-14. The issue spurred the World Wildlife Fund (yet another Moving Giants "Elephant Champion") into action. At the beginning of 2017, WWF had zero rangers in Myanmar. Today, in less than two years -- and in direct response to the elephant-skin poaching crisis -- they have hired and trained 220 rangers, who operate in 18 camps across five regions of the country. “Training rangers is the first step on our journey to win this battle against poachers,” said Christy Williams, country director of WWF Myanmar. 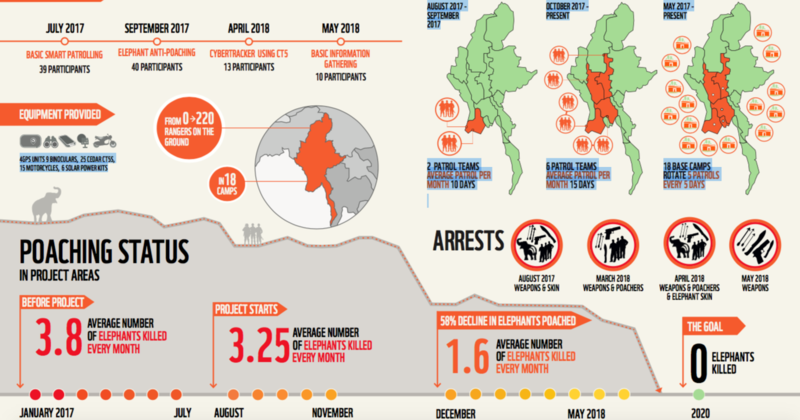 Their presence is already starting to have a positive effect: though there are only less than 1,400 wild elephants left in Myanmar, the patrol squads have achieved a 58% decline in elephants poached across the country. The goal: zero elephants killed by 2020.